Betty Kyalo was yesterday on the receiving end of a vicious Twitter attack after she mocked Raila Odinga’s decision to form a resistance movement. The beautiful TV siren was dissed hilariously by a blunt twitter user who clearly had no chills for her. Betty sarcastically asked what sort of movement Raila Odinga was referring to. The response she got is one she will remembered for days. 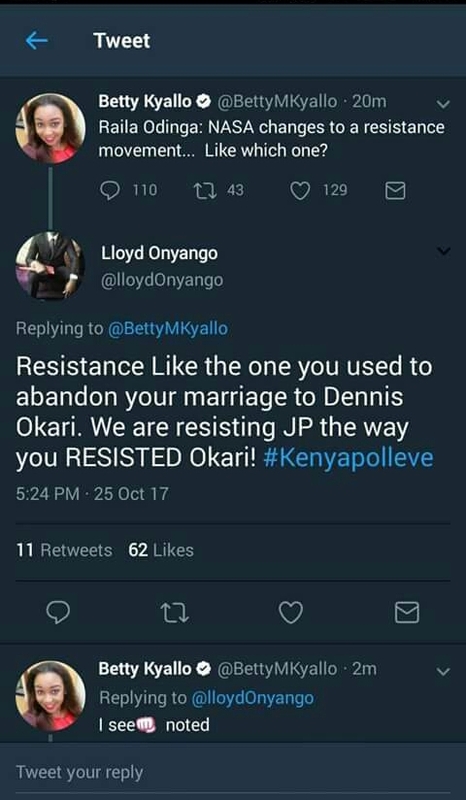 The annoyed Kenyan replied that the resistance movement could be equated to Betty’a abandonment of her marriage to Dennis Okari. Ouch! Bet she didn’t see that coming. Betty has since deleted the tweet. Previous articleHuddah now dating Harmonize? BEEF: 50 CENT AND RICK ROSS AT IT AGAIN!